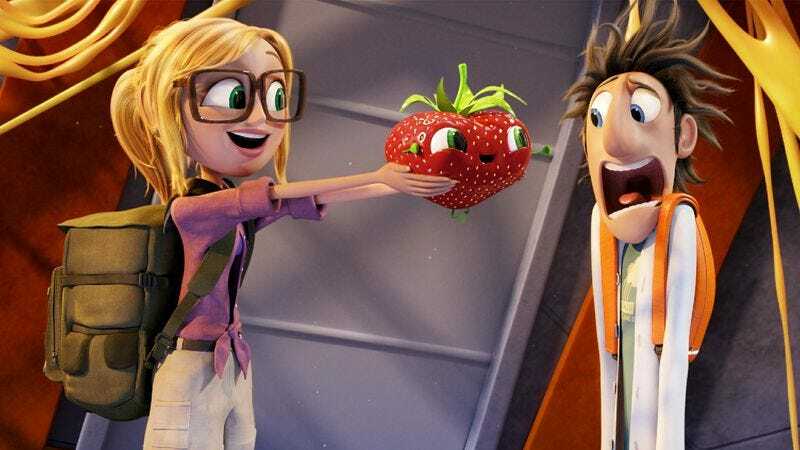 Perhaps in exchange for going to their rooms and sitting quietly for a very important 75 minutes last night, the nation’s parents brought their kids in droves to see Cloudy With A Chance Of Meatballs 2 this weekend. Opening to a healthy $35 million, which is slightly more than its predecessor made out the gate four years ago, the animated sequel provided eye candy for cartoon-loving children—and a brief distraction for the accompanying grownups, who did their best to enjoy all the food puns and stop dwelling, if only for a couple hours (or seconds), on how Breaking Bad might end later in the weekend. Cloudy 2 didn’t quite match the $42.5 million Hotel Transylvania made on the same weekend a year ago, possibly because some parents didn’t leave the house from this past Wednesday until Sunday night, busy as they were watching AMC’s comprehensive Breaking Bad marathon. The good news for the movie is that it’s the only major family flick opening between now and the beginning of November. That gives Cloudy-avoiding adults a whole month to make it up to the offspring they ignored and neglected during Breaking Bad finale week.